NEW YORK CITY (WABC) -- The Yankees and Astros are squaring off in a series that will determine who goes to the World Series. It will also give us a look at the top two candidates for the American League MVP - the Yankees' Aaron Judge and the Astros' Jose Altuve. So who has the edge? Let's look at the numbers. From a physical standpoint, the two could not be more different. 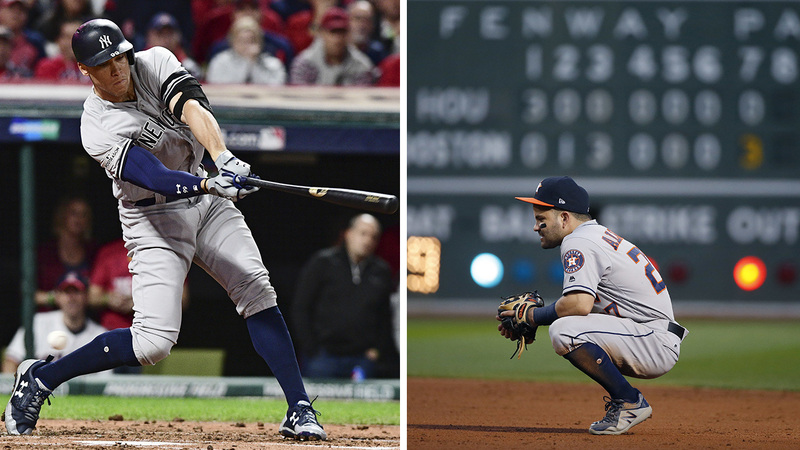 Altuve is one of the smallest players in the league at 5-foot-6 and 164 pounds. Judge, as has been well-documented, is built like a linebacker. He's 6-foot-7 and 282 pounds (picture one Jose Altuve sitting on another one's shoulders). The 2017 statistics for both players are off the charts. Altuve won his third career batting title with a .346 average. He also showed off his lethal power/speed combo with 32 stolen bases and 24 home runs. As for Judge, all he did was set the record for most home runs by a rookie with 52. He also scored and drove in more runs than Altuve. The biggest difference between these two players - aside from their size - is their playoff performances thus far. Altuve is batting over .500 with three long balls. Judge had just one hit against the Indians in the ALDS and struck out 16 times, that's a playoff series record. Not to twist the knife any deeper, but that was Judge's second strikeout record in his rookie campaign. He also set the regular season record for consecutive games with a strikeout, probably the biggest detriment on his MVP resume. The good news for Judge is that playoff numbers don't affect MVP voting. The good news for the Yankees is they won the ALDS despite their star's struggles. If Judge can right the ship against the Astros, he could be adding a American League pennant and an American League MVP trophy to his mantle.